One dietary goal that I've long had for myself is to eat a head of dark green lettuce every day. I find that regular intake of lettuce (being sure to chew it thoroughly before swallowing) helps keep my teeth feeling strong, and of course, I like knowing that my body is getting steady inflow of chlorophyll and plenty of minerals that it can use to keep all of my organ systems healthy. For me, the key to staying regular with lettuce intake is having a wide variety of salad ingredients in the kitchen. 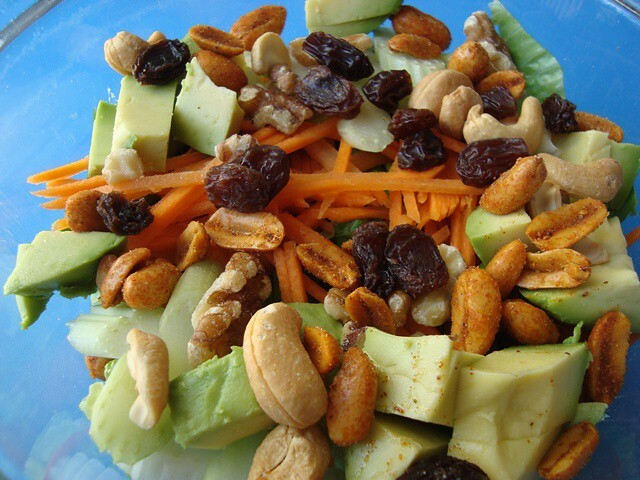 If there are other vegetables, avocados, nuts, raisins, and fruits readily available, I actually enjoy the "work" of putting together a beautiful, healthy, and filling salad. Lying at the bottom are about six large leaves of romaine lettuce, torn into bite-size pieces. To the bed of lettuce, I added shredded carrots, celery, and creamy avocado chunks. To boost healthy protein content, I threw in some unsalted pecans and cashews. For natural sweetness, I sprinkled in a small handful of organic raisins. If you have a Trader Joe's nearby, try their Lime and Chili Peanuts or Cashews. A salad with this many players is good enough to devour without a dressing, but on this particular day, I was feeling honey-mustard-y, so I whisked together a quick dressing with raw honey, dijon mustard, lemon juice, extra-virgin olive oil, and touches of garlic and sea salt. 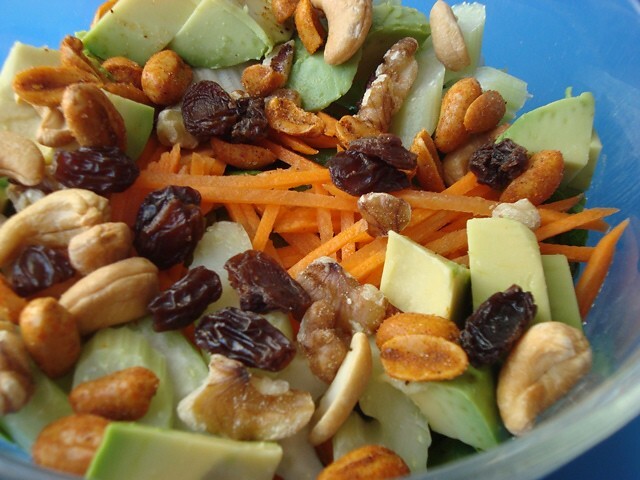 Again, the key to making lettuce-rich salads a regular part of your life is to have a bunch of appealing vegetables, fruits, nuts, and seeds readily available to toss together. Be creative and include any other healthy sides that you have on hand. Legumes like chickpeas or green peas, corn, sardines, leftover chicken, soft boiled egg - all of these widely available foods make for excellent additions to healthy salads. One added bonus to making filling, lettuce-based salads is that you can enjoy them with little or no bread. A little bread now and then is fine for most, but there's no question that over the long haul, all of us can benefit from reducing intake of breads made with refined flours. If you have any favorite healthy salad ingredient ideas to share, please consider using the comments section below. In my next post, I'll show you how I make a honey mustard salad dressing that always earns me a few points with the family. We recycle our jars by filling them each with nuts, seeds, sesame sticks, cranberries etc. for easy access to throw on salads. I also have jars stored at work with ea. so I know I am going to eat a healthy lunch. I take a large Pyrex bowl of greens, sliced carrots and celery to work on Monday (enough for the week.) I always have whole grain wraps there too so I have the opportunity to wrap my salad up. It gives me piece of mind knowing lunch is taken care of, one less thing to worry about ea. morning AND I am saving money from having to buy take-out. Thanks for all your posts, and the pictures are wonderful. Keep up the great work. I sometimes like to dress my salad with a dressing that gets mixed in the bowl: olive oil (or flax seed oil), lemon juice, a spoonful or 2 of organic yogurt, and a little (black lava) sea salt. This eliminates the extra step of mixing the dressing separately--by the time you toss it (especially if you've got avocado chunks in the mix), you end up with a nice creamy "dressing," without the extra work. Also, from a raw food recipe book, I came across a raw kale recipe that I LOVE: take 4 leaves of kale and toss with lemon juice, olive oil and sea salt (they gave amounts, but just go according to taste). Use your fingers to massage the oil/juice/salt into the leaves, and set aside for 10 minutes. Dice 1/4 of a red pepper and add to the kale, along with black kalamata olives (I don't like olives per se, so I substitute pin nuts or sunflower seeds for the olives). Experiment! It's so brightly colored and fresh, you'll fall in love with it instantly! Kudos goes to Jennifer Cornbleet, for her "Raw Food Made Easy for 1 or 2 People" book, from whence the recipe came. I like to add crumbled bleu cheese to Ranch dressing and/or Blue Cheese dressing and you'll need little for your perfect salad. I use cran raisins for color instead of black ones. Spinach, Romaine and Iceberg give the salad great texture, flavor and shades of green; sunflower, sesame, pecan, walnut, cashew or pine for nuts addded to salad (depending on how many nuts you'd like, you might limit to one kind or two), cucumber slices or yellow or green squash, cubed pineapple and/or slices of tossed apples, or mandarin oranges placed strategically, shredded carrots, sliced red preferrably and/or yellow Bell Peppers, frozen petite peas, If avocados are available, slices avocado is great or you if no dressing is chosen, half an avocado on top of the salad in the middle with the hole filled with cottage cheese is also great...totally awesome meal served in a nice individual large colorful or glass salad bowl to open your appetite. Toss lightly or strategically position ingredients. You won't even think about bread, but if you do, think of bread sticks, Italian bread like focata or a sourdough role. Yummy! Yes, you can also add chicken, turkey and crumbled or sliced eggs. I LOVE YOUR INSPIRING LIFESTYLE AND RECIPES!! I just had this salad for my lunch, with the dressing and it was really filling, didn't need bread. Thank you! Hello, Thank you for your continued efforts in helping us make wise choices in our daily diet and lives. Recently, I too decided to incorporate more greens in my diet and have discovered an easy way of doing so. At least 4 days a week, I make myself a litre and a half (6 cups) of green smoothies. I add at least 2 cups of greens of various kinds to my smoothies including avocado, banana, berries. They are delicious and filling and especially easy to digest. That's especially important for us older folks. Thanks again Dr. Ben for a job well done. Up until now I haven't felt like having salad...but then I read all of your suggestions and recipes and I am now ready to go! I am very fortunate to have a friend that keeps me supplied with arugula and other greens well into the Winter months. I usually make a "green drink", but now I see some nice plump salads in the future. Hello and thanks for the very useful info and ideas! This salad is really tasty but have you ever tried it with pomegranate too? It gives it a nice cool, fresh taste.Honey-mustard dressing optional of course! Many times when preparing a salad, I put choped romaine in the bowl first, and then followed by fruits and or veggies of different colors. Dr Bernard Jensen told me years ago that each color represents different minerals in each plant or fruit. So I vary the colors. Like tomatoe, yellow pepper, red pepper or orange pepper, small pieces of apple, raisins, etc.. I usually take my time and spread these systematically on top of the romaine to create a kind of flower. Then , I leave it to eat without mixing. Most eeee and awwww over it about how it looks. I think a beautiful presentation is most valuable.